SAN JOSE, Calif.--(BUSINESS WIRE)--One of the most exciting autonomous driving companies around is taking its cars beyond closed-door testing. 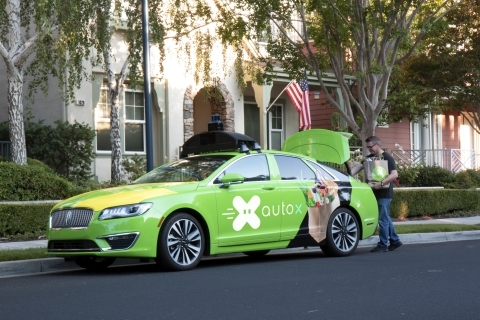 AutoX is launching a grocery delivery and mobile store pilot in San Jose, CA, allowing public users to order and receive fresh produce and other goods delivered by AutoX self-driving cars. Arriving in time for the autumn harvest produce season, the new amenity will be available to customers in geo-fenced areas throughout the city. AutoX’s featured partner on fresh produce is e-commerce company GrubMarket.com, which is one of the key partners fulfilling the grocery orders. GrubMarket sources organic and healthy food directly from producers and offers fresh food at the lowest cost to popular retail stores such as Whole Foods, Blue Apron, Hello Fresh and Chipotle. With AutoX’s affordable self-driving car delivery service, the same high quality groceries can be offered directly to individual consumers at the same price, but with better delivery and shopping experiences. After downloading the AutoX app, users can browse and order items including fresh perishables, vegetables, fruits, etc. There is no need to worry about receiving wilted lettuce or less-than-fresh fruit, because groceries will be well preserved in a temperature-controlled environment throughout their driverless ride over. The coolest part? When the AutoX car arrives, the window rolls down with AutoX’s selections for customers to pick. What sets AutoX's system apart from the L4 autonomous driving crowd is its emphasis on inexpensive but high-resolution cameras as the primary sensor, rather than expensive LiDAR laser arrays and other costly sensors. AutoX’s high resolution camera sensing enables the AI to safely detect small objects such as kids and pets, and see farther ahead for longer distance compared to other autonomous driving technologies that heavily rely on LiDAR. “Highest safety and lowest cost, this is where our key technology lies,” says Jianxiong. With a diverse team of research minds from the likes of MIT, Stanford, CMU, Berkeley, along with engineering talent from Google, Apple, Microsoft, Amazon, and Ford, AutoX is determined to make a mark on the autonomous driving industry. AutoX’s grocery delivery and mobile store pilot will roll out in two phases: the first pilot is in San Jose, with phase two expanding the pilot west to Mountain View and Palo Alto, with more delivery partners joining soon. You can find photos and video in the AutoX media kit here. AutoX CEO Jianxiong Xiao and COO Jewel Li are available for interviews upon request. AutoX is redefining the future of Location Based Services and bringing self-driving cars technologies to everyday lives. Its mission is to provide reliable, safe, and affordable autonomous delivery power to make everyday lives more convenient. Self-driving car startup AutoX is launching a grocery delivery and mobile store pilot, the first of its kind, in the Bay Area.